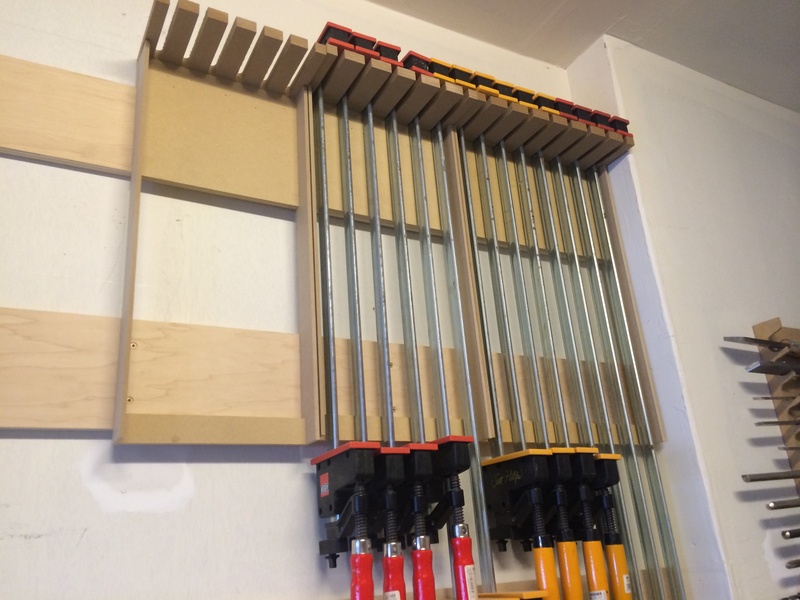 These super simple clamp racks are designed to hang on french cleats that I recently screwed to my walls. The fact that I was screwing so many things to the walls and then moving them around to rearrange things in the shop was becoming a bit of a domestic controversy so I decided to putty over the screw holes and hang french cleats whenever I replace or rearrange a section of my wall-mounted storage. These french cleats are 3/4″ paint grade maple ply from the home centre sawn into 6″ wide strips with 45 degree bevels on one edge. There are two 2 1/2″ #8 construction screws anchoring each cleat to the wall at each stud location. For the sake of keeping things modular and interchangeable, I spaced my cleats on 15″ centres vertically. I’ll use that same spacing everywhere in the shop. I couldn’t find any information that put specific numbers to the weight that each cleat can hold anywhere on the internet. The best I could find were comments like “3/4″ is plenty strong” and “well I hang lots of heavy stuff on it and mine hasn’t fallen down yet”. So yeah. 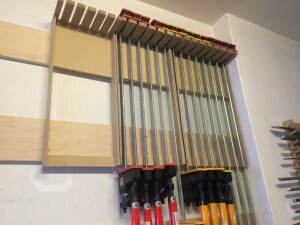 I hung clamps on mine, they’re pretty heavy, and it hasn’t fallen down yet (although I waited a few months between building these and writing this article to make sure). These clamp racks were banged together fast using scraps, glue and brad nails. 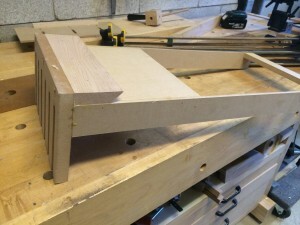 The cleats are hard maple leftovers 2 1/4″ wide, which are glued and nailed to 1/2″ MDF back boards that are about 8″ wide. That is the critical joint that gives the french cleat its strength, transferring the force that would otherwise pull the cleat off the bevelled edge into a downward force that instead pulls it tight to the wall. The top parts with the fingers to hold the clamps are 3/4″ MDF, screwed into the cleat from the top with 1 1/2″ screws. The finger spacing and length is specific to each type of clamp, so you’ll need to measure if you want to make these for yourself. 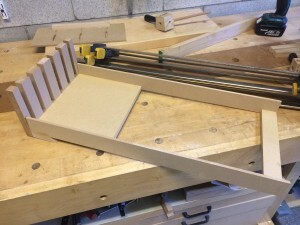 For my F clamps, the spacing was 1 1/2″ on centre, and for my Besseys, it was 2″ centres. The fingers on my F clamp racks are just long enough to reach most of the way to the yellow plastic pads without preventing the bar of the clamp from reaching the back of the slot. To the side of each cleat, I nailed and glued a 1/4″ hard board extension, which adds practically no strength to the rack. The purpose of the extension is purely to hold up the 1/2″ spacer at the bottom of each rack to keep the clamps plumb as they hang. 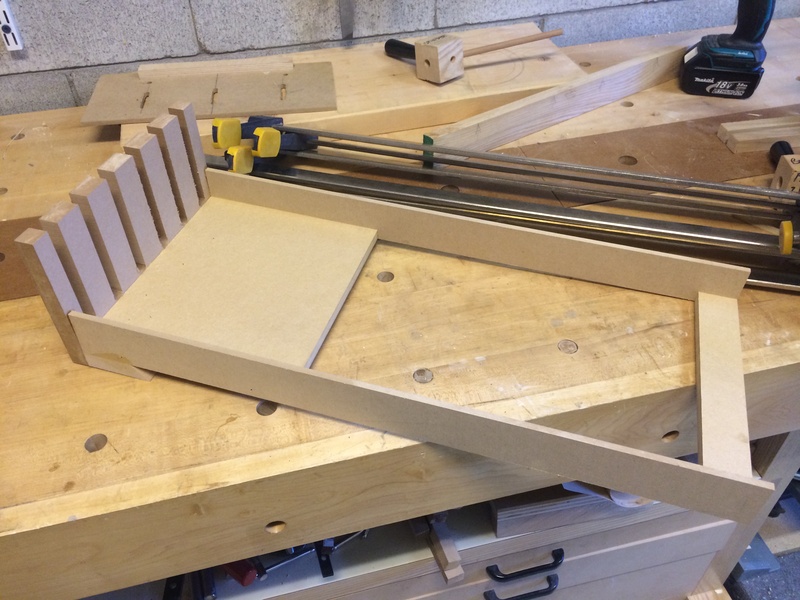 My intention there is to prevent the MDF fingers from being pushed down at the front and sagging over time, and to keep the weight of each clamp as close to the wall as possible. 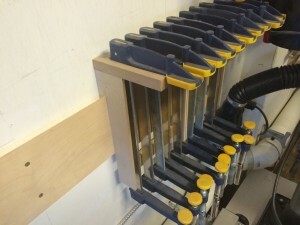 I kept each rack small, limiting each to holding no more than 8 clamps. This gives me the freedom to relocate groups of clamps relatively independently. If I were doing it again, I’d actually limit it to 4 or 5 instead, because the difference in materials used is negligible but the smaller racks are much more flexible.